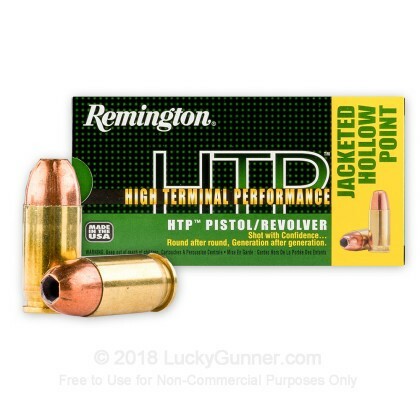 Remington's High Terminal Performance line of 380 Auto 88 gr Jacketed Hollow Point ammunition provides massive energy transfer and expansion, making it perfect for home defense. This 380 ACP round was specifically designed by Remington to be super smooth feeding, making it a solid choice for shooters with a misfeed prone firearm. After firing five rounds of Remington 88 gr HTP from a Glock 42 into synthetic ballistic gelatin from 10 feet away through four layers of fabric to simulate clothing, we then measured the expansion and penetration of the bullets for this .380 Auto (ACP) load, which you can see in the chart below. 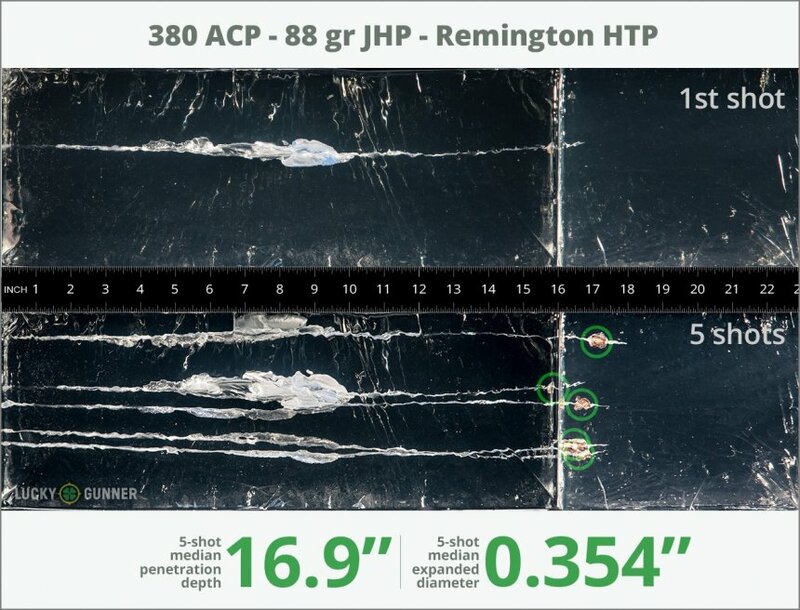 Finally, if you'd like to see how this Remington load compares to other .380 Auto (ACP) loads, check out the diagrams at the bottom of the page. Want to know more about our ballistic gelatin testing and self-defense ammo? Check out Lucky Gunner Labs for more information. 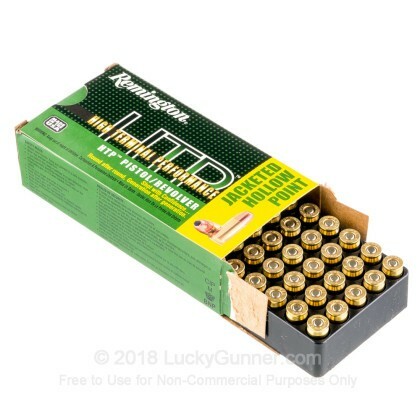 How do the results for this Remington .380 Auto (ACP) compare to other 380 Ammo? 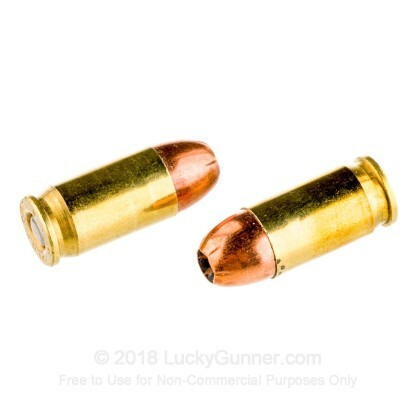 0.78" This ammo: 0.35" Min: 0.35" Median: 0.355" Max: 0.78"
16.9" 0" 6.5" 13.3" 28.7" This ammo: 16.9" Min: 6.5" Median: 13.3" Max: 28.7"
I was out shooting yesterday and this round worked way better than any other round I tried through my Sig. I liked it so much I'm going to order it up in bulk today. 75 rounds through new Remington RM380. Feeds and shoots well. Goes where I aim it, so I need to work on that- just like my golf swing. I only shot 20 rounds through my RM380, works great.No jams, stovepipes really accurate. I used this ammo in my Ruger LCP and it performs very well. I bought 500 rounds of it I liked it so much. Fired in S and W Bodyguard. 1 out of 10 misfired. Other brands work fine. 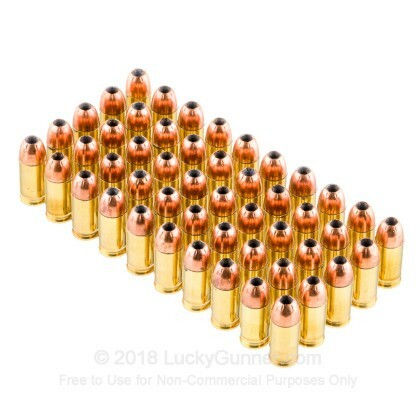 This is the ammo I use in my 380, because I have shot hundreds of rounds of Rem 9mm HP in several different handguns with excellent results. I have not shot the 380 a lot, so far I have had very good results. I live on a farm in the country, so I am able to shoot just about every day. Q: Is this the same as the UMC green and white box? It's similar and has the same weight. A: Similar weight yes. The projectile is however different. This is a Hollow Point round that is intended for defense purposes. The UMC is a great range/ training round. Q: Will the Remington HTP avoid jamming problem in a Bersa Thunder .380? A: The Remington HTP is one of the more reliable hollow point rounds on the market, however, each semi-automatic pistol is different. 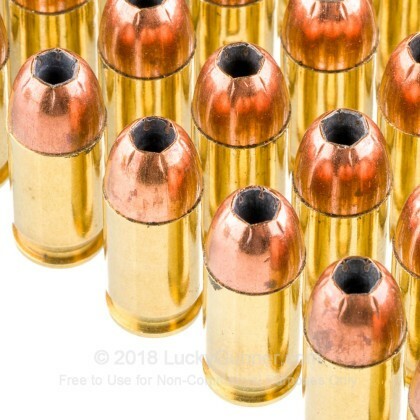 When dealing with the lower powered rounds such as the .380 auto, you have to try each round to make sure that YOUR particular pistol will reliably feed that round. This same advice is good for all carry ammo, but more especially for .32. .380, and .22 calibers. Q: Hey LG, What is muzzle velocity and energy of this 380 88 gr Remington HTP amo? A: Hello Steven, Remington lists the muzzle velocity of this round at 990 fps with a muzzle energy of 191 ft. lbs. 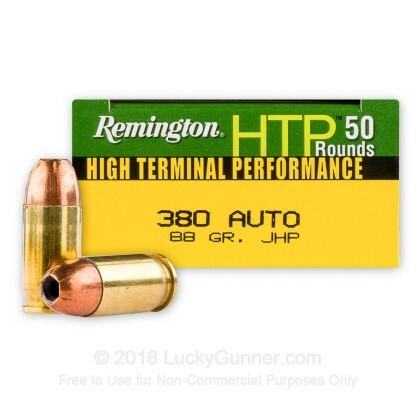 We also have this 380 Auto - 88 Grain JHP - Remington HTP - 500 Rounds ammo in stock in a bigger quantity.